After being surrounded by deaths and near-deaths, introverted chemist Bram Tillman wishes he could undo the past year. Then beautiful Daniel Royer shows up with a warning about more danger ahead—and a promise to use vodou to help Bram discover what’s trying to kill him. But while Bram’s attraction to Daniel grows, vodou spirits change Bram in unexpected ways. Bram has lost his lover in the last year and with him, much of his joy in life. In addition to that, he’s the victim of a random attack that puts him in the hospital. Next come a series of near death experiences no one can explain… except for Daniel, the brother of the man that put Bram in the hospital. Daniel’s answer: voodoo. Bram, a man of science is not swayed by this argument but he is entranced by Daniel. When things continue to get strange he turns to Daniel for help, and together they put an end to the strangeness and find love. This is the best of the bunch. Very sensual, you can almost hear the French, smell the rum, and taste the sweat. It’s a great short story in that it absolutely fulfills it’s obligations of the five elements of a story: great characters, an interesting setting, a fully developed plot with tense conflict and a very satisfying resolution. Colin Hastings is sent to Jamaica in 1870 to save his father’s sugar cane plantation. If he succeeds, he can marry his fiancée back in London and take his place in proper English society. But Colin finds more than he bargained for on the island. His curiosity about Obeah, the native folk magic, leads him to agree to a dangerous ritual where he is offered his heart’s most secret desire—one he’s kept deeply buried all his life. What happens when a proper English gentleman has his true sensual nature revealed and freed by the Obeah spirits? Colin doesn’t know it, but he’s in love with his best friend. In 1870, you don’t admit that to just anyone, even yourself. It takes a voodoo ceremony for him to make this realization and then he has to convince his friend to take a risk, if that weren’t enough. Following a close second as best of the bunch, this was another great short story that fulfilled its obligations in a few pages. Very well crafted. It’s historical and educational without being pedantic. The writing is very dark and evocative and quite unlike the previous books/stories I’ve read by Eli Easton. She always produces an amazing story and this is no different. When a hot tip leads Kansas City reporter Taylor Dunton to a series of grisly murders, his investigation points to Myles Parry and his vodou shop. Myles wants nothing more than to practice his religion in peace, and he hopes Taylor can help him show the community they have nothing to fear. The problem is all the clues point to Myles as the suspect and only Taylor can help him prove his innocence. However, this case has also caught the attention of the vodou spirits of the Lwa… and they’ve taken an interest in Taylor as well. Taylor wants to move up in the journalism world. He gets a hot tip from a friend on the force that leads him to a voodoo shop for answers. There he meets a practitioner (of voodoo) who teaches him the truth behind the myth and together they solve the mystery and fall in love. This was an interesting story, not unlike The Dance, filled with information and a unique look at what religion is. Though I didn’t feel the love as much as I did in the first two stories (it was insta love without a lot to back it up) I enjoyed the writing and ending was excellent. When Alejandro Valera finds a book of black magic in New Orleans, he ships it to his friend Matthew in New Hampshire so he can read it when he gets home. Unfortunately, Matthew’s dog, Spartacus, gets to the package first, and Alejandro returns to find Matthew locked out of his apartment by the suddenly vicious pit bull. The boys call on all the magic they know to free Spartacus from the evil spirit, but they might need to accept that they’re in over their heads. Alejandro finds an old book on magic and sends it home to his childhood best friend, Matthew, for safekeeping. Something escapes from the book and possesses Matthew’s dog. Together Alejandro and Matthew must use the magic they learned from Alejandro’s Abuela to rid the dog of the spirit. Oh, and along the way they admit that they have always loved one another in a more-than-friends way. This was the weakest of the lot. The love story took a decided back seat to the voodoo and felt a little out of place. Perhaps if this had been longer the romance could have been developed and given a proper resolution, but the ending was a big disappointment and left me unsatisfied. 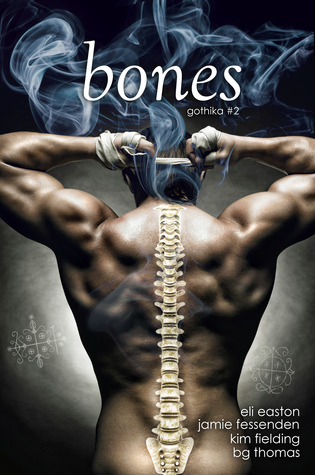 This entry was posted in Adult (18+), Contemporary, Fantasy, Gay For You, m/m, magic, Paranormal, Romance on November 10, 2014 by Morgan.